The Lyrid meteor shower, expected to peak late Saturday night and into Sunday morning over North America, promises one of its best shows in years, astronomers say. Especially beneficial is Saturday's near-moonless night. The Lyrids are set to peak after midnight, early April 22. NASA folks themselves are planning to make the most of the event. They are launching a balloon cam from Bishop, CA, in the hopes of getting up-close meteor footage and they are offering an Up All Night NASA Chat, from 11pm-5am Eastern U.S. Time. Simply follow this linkto ask scientists questions about the Lyrids. The Lyrids (pronounced Lie-rids) have been observed for more than 2,500 years -- during 687 B.C., Chinese records noted that "stars fell like rain". Aside from some similar key years, most recently 1982, when 90 and more shooting stars were seen for a period of hours, the Lyrids have been a minor meteor shower. Can't watch it at the exact time? Don't worry -- astronomers tell us that meteor showers can last for hours before and after the peak date. Meteors occur when the Earth passes through streams of dust and debris from ancient comets which have entered the Earth's atmosphere. (When the comet has flown close to the sun, its dirty ice evaporated and that, in turn, caused the comet dust to spew into space.) The Lyrid meteor shower hails from the comet C/1861 G1 Thatcher, which orbits the Sun only once every 415 years, even though we see the Lyrids that result from it annually. The orbit of this comet appears to lie in the constellation Lyra, the source of the name Lyrids. 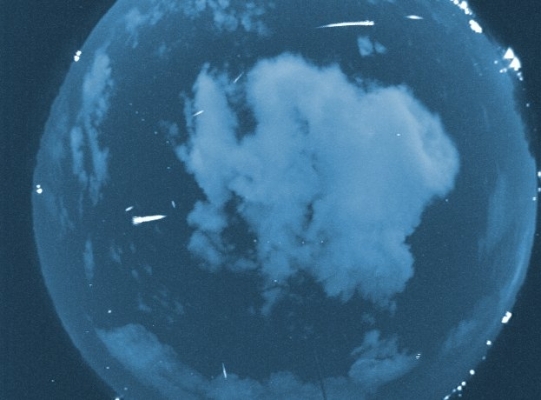 Meteors are best viewed with the naked eye. Sky watchers should grab a chair (ideally one with some neck support), and a blanket if it's cold, and head outside where you can see the largest patch of night sky possible (with as little city light as possible), and look up. This American Meteor Societypage is a great site for exploring more about the Lyrids and where and when to see them in your local night sky.